The original Globe Electric Designer Series 6-ft 3-Outlet Surge Protector Power Strip with 2 USB Ports was specifically designed to eliminate the unsightly traditional power bar and replace it with one you’ll want to show off! The added convenience of the handy space saver right angle plug allows your furniture to sit flush to the wall - creating more space without bent wires. A 6-foot fabric covered cord gives you the added convenience of increased range from power outlets. 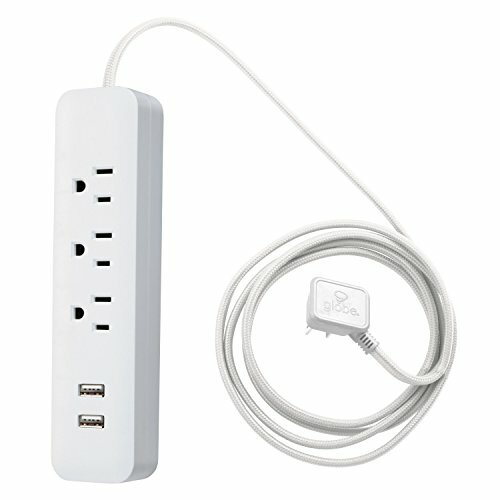 The three grounded outlets are perfect to use with small appliances and electronics such as lamps, computers, printers, and home theatre systems. The 2.4A combined USB ports ensure a fast charge for your devices. Compatible with smartphones (Android, iPhone), tablets (iPad, Android, Surface), eReaders (Kindle, Kindle Fire), cameras and more. Surge protected to 300 joules, you can rest assured that your small electronics are safe while plugged in. Recommended for indoor use. Patent pending.